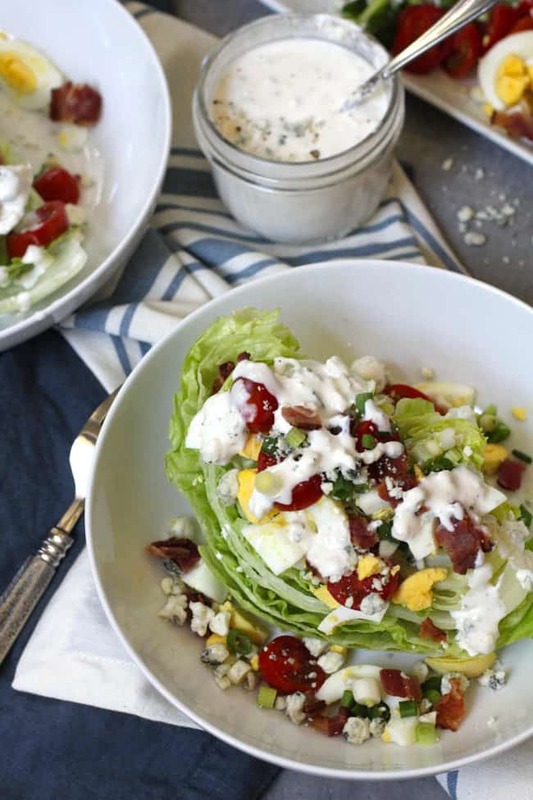 Classic Wedge Salad with Blue Cheese Dressing is THE perfect side to go with a big juicy steak or any entree for that matter. It’s crisp and simple, and the homemade dressing brings all the flavors together. Make this one for date night in! I’ve seriously made this salad about six times in the last month. Since Mike and I are (sort of) empty nesters, this recipe is perfect because it’s good for two nights. I’ve made it to pair with steaks, chicken, soup, and just plain old roasted veggies (as in veggies and salad night). 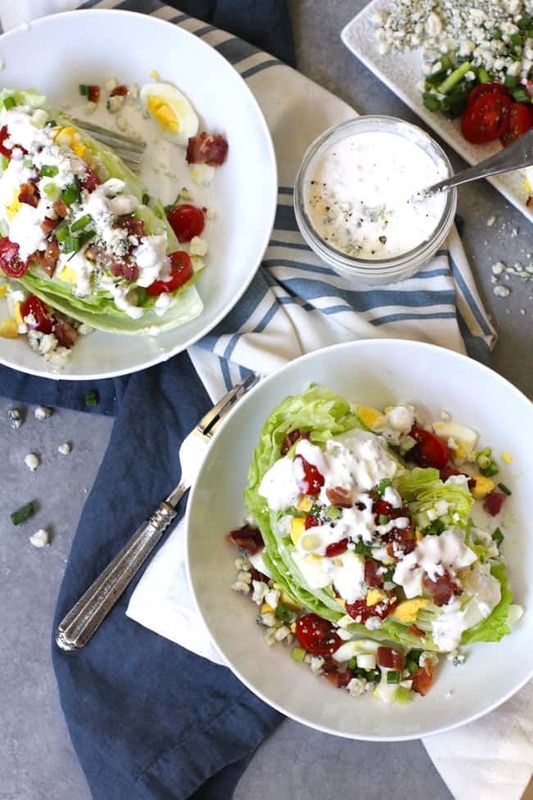 Let’s talk about the classic ingredients for wedge salad. 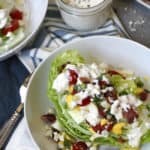 Iceberg Lettuce – Remove the outer leaves, give it a quick wash, and slice it into wedges. Bacon – My favorite way to cook bacon is to bake it in the oven until crisp. Hardboiled Eggs – Love to make eggs in the Instant Pot now. Cherry Tomatoes – Slice them in half. Green Onions – Chop them up. This dressing is definitely the star of the show! When mixing the dressing, mash some of those blue cheese crumbles into the other ingredients. Really, it’s good with practically anything. Soup and salad is a go-to for me, OR just double the salad and call it dinner. The dressing stays fresh in the refrigerator for 4-5 days. 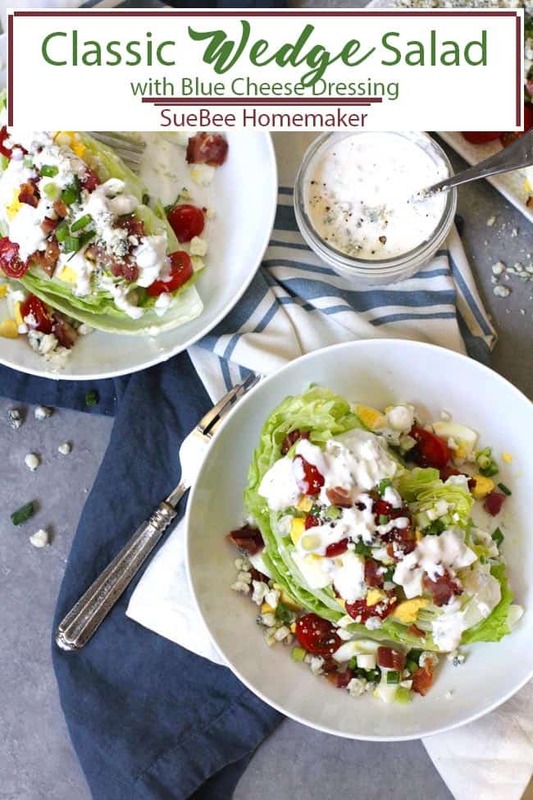 Classic Wedge Salad with Blue Cheese Dressing is THE perfect side to go with a big juicy steak or any entree for that matter. It's crisp and simple, and the homemade dressing brings all the flavors together. Make this one for date night in! 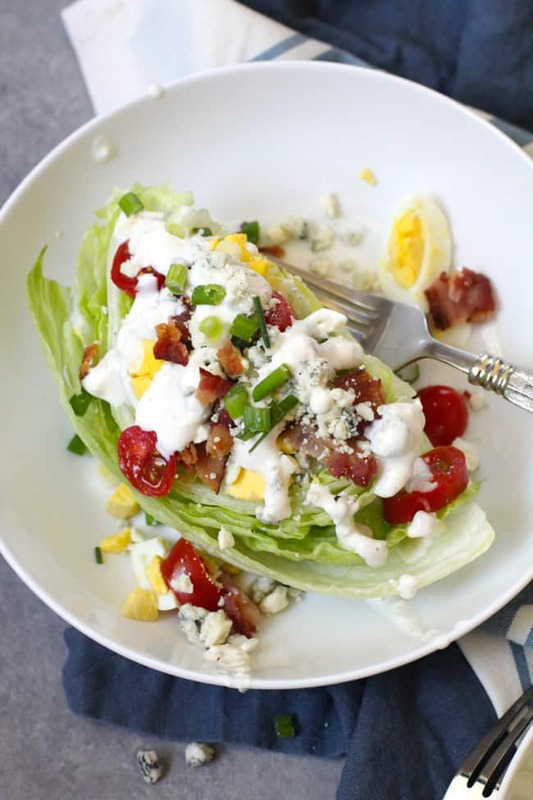 For the salad, arrange the bacon, eggs, onions, tomatoes, and blue cheese crumbles on top of the wedge pieces. For the dressing, mix all ingredients together. Mash some of the blue cheese crumbles into the liquid, and mix well. Store salad ingredients in the refrigerator until serving. The dressing stays fresh in your refrigerator for up to 4-5 days. 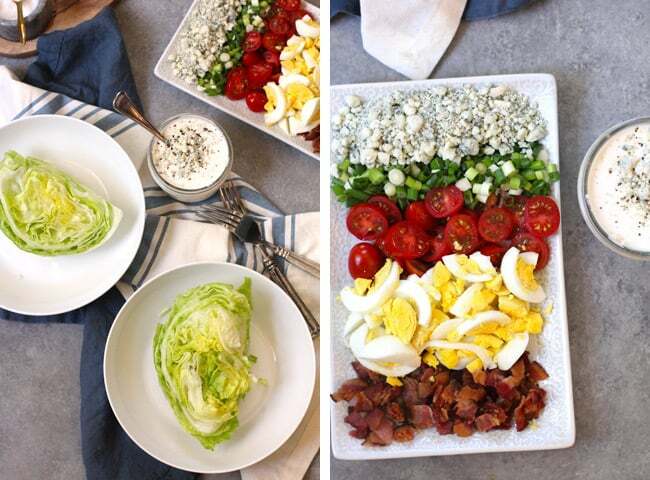 Classic Wedge Salad pairs well with so many things. See blog post for some ideas. I have had this salad from the original batch for the last few days. It’s delicious. I wonder what the dressing would tast like without the sugar. It was still tasty, but I like a more poignant blue cheese taste. However, it was easy and I will make this again without hesitation. I love this salad! 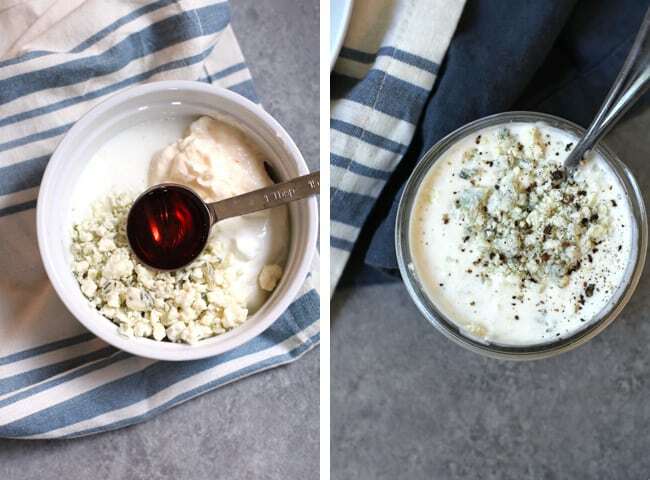 The Blue Cheese crumbles are a must!